Wood bison are the largest native land mammal in North America. Wood bison calves can stand when they are only 30 minutes old and can run within hours of their birth. 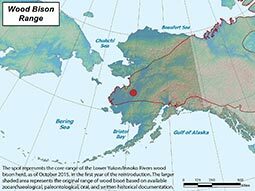 The last reported sightings of wood bison in Alaska, prior to reintroduction, were in the early 1900s. Wood bison can provide a variety of benefits to people including high quality meat, warm and durable hides, and support for wildlife viewing, tourism and guiding. Native Alaskans once hunted wood bison for their meat and hides, and some herds in Canada continue to support regulated harvests. 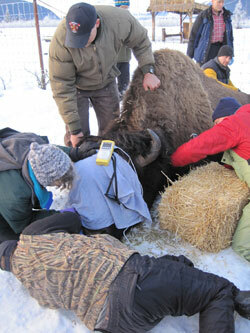 Alaska Department of Fish and Game biologists are monitoring the newly reintroduced wood bison. The management plan suggests that hunting may occur when there is a harvestable surplus of about 20 animals, with the overall population at about 250 animals at that time. Establish a wood bison herd in the Lower Innoko/Yukon River area and manage it for long-term viability. Ensure adequate staffing and funding for all phases of wood bison management. Minimize conflicts between humans and wood bison. Encourage cooperation among land managers to ensure reasonable, standardized land use and access to wood bison. Manage harvest allocation to equitably benefit local residents, nonlocal residents and nonresident hunters. 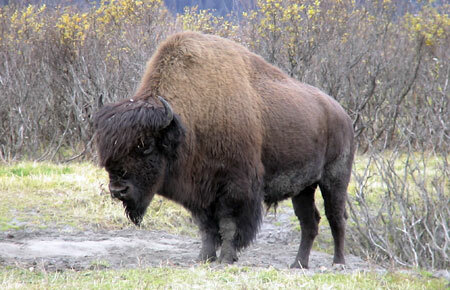 Minimize wood bison impact on other wildlife species and the ecosystem on which they depend. Ensure continuing communication among all user groups. Ensure hunting does not prevent herd growth and expansion into adjacent areas where suitable habitat exists. Begin hunting only after the herd grows large enough to provide a harvestable surplus of at least 20 animals (estimated to take three to ten years from introduction in 2015). Eighty percent of the permits will be drawing permits (with no more than 10 percent for nonresidents) and 20 percent will be registration permits issued in each of the four surrounding villages. Alaskans who are not shareholders of the Native corporation lands will pay a land use fee of $300 (nonresidents will pay $500 to $1,500) to the nonprofit Randy Rogers Wood Bison Foundation Fund established to provide scholarships and training for village youth to learn more about wildlife. Biologists are monitoring the newly introduced population, and the introduction process itself is an experiment. A number of bison were released with radiocollars and equipped with GPS devices, enabling biologists to track their movements. This provides insights into their core range areas, how they explore new habitat, how some individuals travel exceptional distances relative to most wood bison, and how they respond to their new habitat. There will be future opportunities for you to be involved in wood bison conservation, including during proposed regulatory actions under the ESA and site-specific cooperative planning efforts for each restoration location.